Launched in August of 2016, the Adherence and Community Engagement (ACE) Team is Edmonton’s only pharmacist-led HIV outreach team. 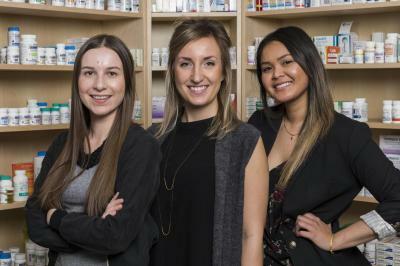 Consisting of two pharmacists, Klaudia Zabrzenski and Essi Salokangas, and licensed practical nurse, Sokun Om, the ACE Team is based out of the Mint Health + Drugs Community Members Pharmacy in Edmonton. The ACE Team works to address three key areas of the HIV/AIDS Care Continuum/Treatment Cascade: engagement and retention in care, initiation of antiretroviral therapy, and achieving viral suppression. Understanding that a patient’s health issues do not occur in isolation, the team approaches patient care with a holistic lens and offers intensive case management. Often, the team must first address a patient’s social needs as a means of improving their broader health outcomes and medication-taking behaviors. ACE has supported transient, highly disengaged patients – previously never considered candidates for therapy – successfully start and maintain adherence to antiretroviral therapy. “We hope that in achieving greater patient stability and suppressed viral loads, our team’s interventions can demonstrate reduced HIV viral transmission, reduced instances of new HIV cases, as well as a reduction in hospitalizations and incarcerations,” says Klaudia. To address the many needs of their patients, ACE works closely with a variety of professionals from the Northern Alberta Program, Boyle McCauley Health Centre, and other community resources. They are often hailed as the “eyes and ears on the street,” facilitating more regular patient updates and identification of unseen issues affecting hard-to-reach patients. “We rely heavily on the knowledge and expertise of several social workers within the community. We know we cannot do everything ourselves, nor should we when there are others better suited and more equipped to handle these aspects of patient care. We’ve learned to act as liaisons between our patients and community agencies,” says Sokun. Being on the ACE Team means working creatively and dynamically in an ever-changing practice. As a mobile team, technology plays a significant role in their practice. To keep everything running smoothly, the team uses a categorized digital calendar system to keep track of patient appointments, lab work, and important follow ups. They also rely on their team cellphone and tablet to coordinate care and collaborate with providers while on the go. Since coming together, the two most valuable lessons the team has learned are the importance of advocacy and the necessity of creating links to community resources. “We are reminded daily of the importance of being strong advocates for our patients, who often have trouble speaking for themselves. We help prevent evictions, follow up on referrals, attend appointments with patients to help them communicate their concerns, and assist in various crisis situations,” Essi reflects.